Pearl Harbor had been bombed by the enemy and America was no longer safely isolated from the rest of the world. World War II ended the Great Depression but brought in a period of fear and anxiety along with pride and patriotism. There was no time to romanticize the good old days that had been idealized during the Colonial Revival of the 20s and 30s. The present was what mattered, the present and winning the peace. It was not so much that quilting disappeared at this time; it simply became less important in the greater scheme of things. Some folks quilted and some didn't but the world was focused on much greater concerns. The American way of life was threatened; the world was at risk. A delightful photograph of a young Kansas woman holding a quilt is inscribed with "I love you - hurry home and help me use it, honey." 3 The picture was probably sent to her husband overseas. As in other times of war patriotic themes were popular in quilts. Magazines and newspapers published quilt patterns including stars and stripes, airplanes and V for victory patterns. Mountain Mist published two patterns with the eagle motif one in honor of army and the other navy aviation. 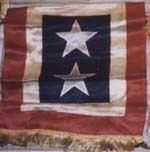 Quilt like Blue Star Banners were made and hung in windows signifying that the family living there had someone in serving in the war. Saddest of all were those with a gold star, signifying that a soldier from that household had lost his life. Women went to work in great numbers to fill in for the men who had gone to war. In fact even more workers were needed to manufacture materials for the massive WW2 effort. A million men would be lost. Although many women left their jobs and went home again after the war others remained in the work force. Even after the economy recovered and the war ended quilting continued to be out of vogue. The general public's perception was that quilting was something only poor people made quilts because they couldn't afford to buy modern bed coverings. The focus was on the future, the modern way of living including modern possessions and modern design. Also there was a general attitude that the quality of quilting was poorer than it had been in the past. An over idealization of the perfection of old fashioned quilting contributed to this impression. 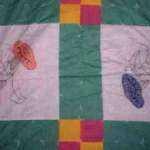 The making of quilts with kits and the use of polyester fabric were cited as proof of this belief. Quilts pieced by machine were considered inferior based on the myth that quilters of the past always pieced and quilted by hand. Quilts made during this mid century period were often not quilted closely and many quilts were simply tied. Of course there were still some women who prided in doing fine hand quilting. In her doctoral thesis Valerie S. Rake 4 suggests several reasons as to why quilt making became less visible after the 1930s. She writes that, "Changing styles in home decorating; the increasing number of leisure activities for women, including radio and television; sports and civic groups; and, most notably, the decline in home sewing of clothing probably all contributed to the contraction." Rake found that those women who did quilt often got their start later in life perhaps as a part of a church sewing group that made quilts to raise money or to give to the needy. She points out that more women went on to further their education than had done so previously and others worked in offices, factories or stores for a period of time before marrying. American culture had changed, as a result of these changes many brides preferred modern bedspreads to what they considered to be old-fashioned quilts. Women who quilted during these years were more likely to buy most of the fabric for their quilting projects. With the decline in sewing there were few left over scraps from making a dress or shirt. Quilts were no longer a cost efficient form of bedcovering. 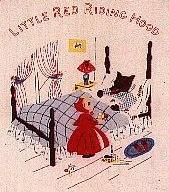 During the Great Depression making a quilt had been a way a woman could be creative using primarily materials at hand. Now women were quilting more for the companionship it provided through church or other sewing groups. Some still made quilts for special occasions like weddings and births. Many made quilts for children in thier families. From 1940 to 1965 Marion Cheever Whiteside Newton 5 designed storybook quilts on such themes as Swan Lake, Pinocchio, The Ugly Duckling and Peter Rabbit. Many mothers and grandmothers were inspired to make a quilt using a delightful children's theme. The results of World War II were devastating to Europe. People from both sides of the conflict were left destitute. Attempts to get needed food and bedding to these people was thwarted by restrictions on what could be shipped to various regions so much of the relief didn't get to the people until the world war was over. Country folks still quilted though perhaps not at the same level. State and local fairs continued to feature quilt competitions and shows. Quilt historian Barbara Brackman 7 reminds us, "Quilting did not die out in rural America after World War II, although few new patterns or styles evolved until the 1970s." Another significant group that kept quilting throughout this period was the Amish. 8 New styles in furniture or fads in entertainment did not touch their communities. Quilting continued as it had for years. In the resurgence of interest in quilting during the years surrounding the Bicentennial of the United States in 1976 the American public discovered the beauty of Amish quilting. Although quilting was out of vogue during the 1940s through the 60s we can see that quilting was still well and alive beneath the surface of more pressing cultural concerns.